is a garden/greenhouse spray repellent and insecticide. It is proven effective against aphids, spider mites, whiteflies, cabbage loopers and beet armyworms for up to 2 weeks. The chief active ingredient, CAPSAICIN, is an extract from cayenne pepper. It's harmless to humans - in fact, it's as edible as the sauce on barbecued Buffalo wings. For years, organic gardeners have experimented with hot-pepper home remedies against every pest, from aphids to squirrels. Hot Pepper Wax bug repellent borrows from the best of their wisdom ... and takes it one step further. Using a special formula and process (both of which are patented), Hot Pepper Wax insect repellent blends capsaicin with a highly refined paraffin wax and other "food-grade" ingredients. The result is a spray that coats plants with a harmless, micro-thin barrier to deter pests. Some insects are done in by capsaicin, others by the wax. Hot Pepper Wax also works as an "anti-transpirant," reducing water loss and resulting stress...a true benefit for new transplants! 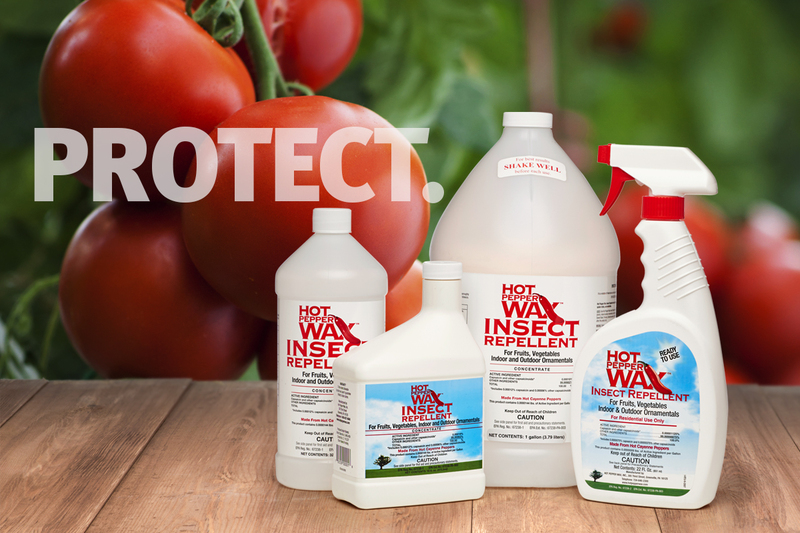 Hot Pepper Wax insect repellent perfectly safe for garden produce, too - warm water rinses it completely away! It's available in a ready-to-use (RTU), 22-oz. spray bottle; or in concentrate form for larger applications. Hot Pepper Wax insect repellent is patented and EPA-registered. is a safe, effective liquid spray for use on plants. The secret, patented formula stops animals like tree squirrels and rabbits from turning your garden and shrubs into their salad bar. 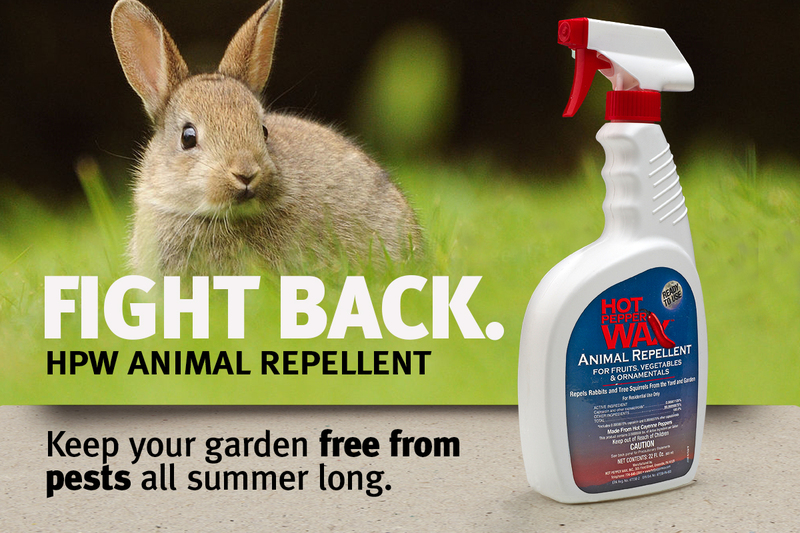 Hot Pepper Wax animal repellent contains no chemicals or poisons, and it's biodegradable-it won't harm the animals or your soil! Hot Pepper Wax animal repellent traces its beginning to an outbreak of spider mites in a commercial greenhouse in 1989. An amazed researcher noted that the tiny bugs had damaged all the plants, except for a few fresh cuttings treated with an experimental coating wax. And those plants were untouched! This discovery led to the science that created Hot Pepper Wax-a biodegradable defense shield that promises a mouthful of fiery heat to any pest that tries to take a bite. Pretty soon, Hot Pepper Wax customers made a discovery of their own: Hot Pepper Wax is not just a good insect repellent, it's a GREAT rabbit and squirrel repellent, too. Responding to this newfound demand, Hot Pepper Wax began the application and testing process required for EPA registration. 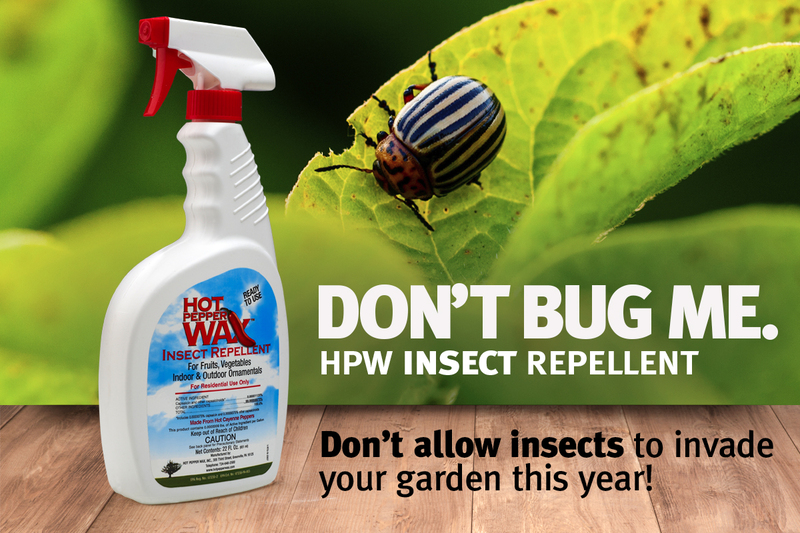 Hot Pepper Wax animal repellent is now available alongside HPW Insect Repellent. Hot Pepper Wax's patented formula stays put. Rain won't wash it off, so you don't have to re-apply after every rainfall.